In today’s world of work, we can be certain of three things: there will be change, there will be stress and these two factors may eventually cause conflict between staff and/or their leaders. We speak to many professionals who work in a wide range of sectors and the most common source of distress is the ever-increasing pace and volume of work. The expectations of working faster with fewer resources and having to do more with less, are causing serious problems. These problems can cause team members to experience resentment and internal conflict. Many of these issues stem from budget cutbacks. As a result, companies and organizations face massive changes: layoffs, reorganizations, job abolitions, changes in mandate, elevated conflict and a lot of uncertainty and fear of what is yet to come. Perhaps one of the most significant changes we have seen in the last few years – again, directly related to budget cutbacks – is the increase in competitive relationships in the workplace. This can directly contribute to interpersonal conflict, increased stress and sick leave, and a general dissatisfaction with work. Navigating through these challenging times can be hard – even for the most resilient. So, what can we do about all this change? While conflict and stress are never truly preventable, we can learn effective approaches for maximizing positive outcomes. Here are three strategies to help you navigate change and conflict. We all know that change can be difficult, however, even more stressful is the time between the end of the old and the beginning of the new – the transition phase. The ability to navigate through the transition phase is all about the practice of resiliency. By recognizing our strengths and working on our areas of growth, we will be better equipped to deal with the uncertainty of this phase. It is also important to explore what about the unknown is causing us the most stress. Is it that we are afraid of losing our job? Losing a good manager? Losing control over certain roles and responsibilities? A good strategy is to focus on the areas of our lives where we have control. 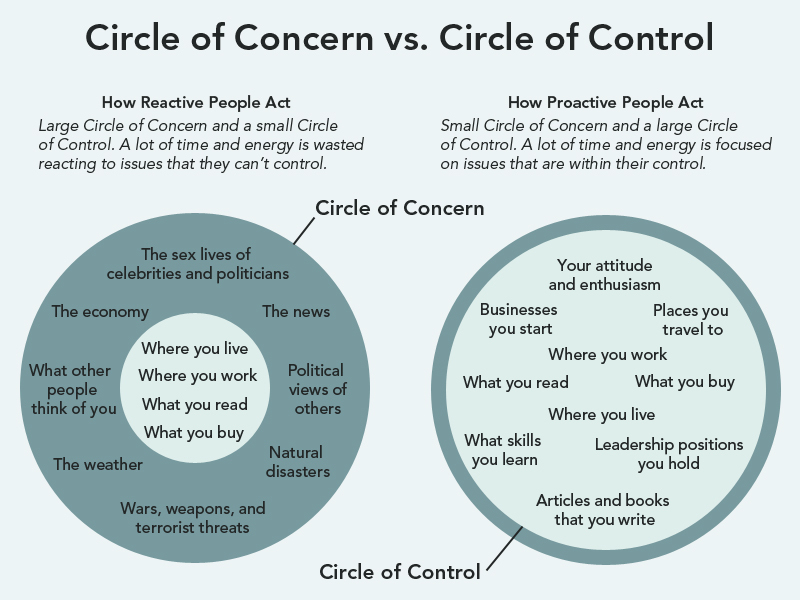 In The 7 Habits of Highly Effective People, Stephen Covey presents the circles of concern and influence. He encourages us to focus on those things in our lives that we have influence over and avoid squandering our energy on those that are outside of our control. However, there will be times when we truly have no control over the future. During these times, we can fall into what psychologists refer to as “fortune-telling.” This is when we obsess over all the possible scenarios that may or may not take place. Fortune-telling can be a normal response to uncertainty, but if it dominates our days and nights, we may need to seek outside support from a counsellor, coach or a mentor. Change can be hard for many of us, and it can elicit a whole host of reactions among different people. Understanding your unique response to stress can help you be proactive about taking positive steps to care for yourself. A good strategy is to reflect on the question: “What does change and uncertainty mean for me?” Consider this question in general terms, not just as it relates to work. Am I someone who thrives on change? Or, does change make me anxious and irritable? What are my stress responses? How do I act when I am stressed? Are my reactions to stress similar or vastly different from those of my colleagues? How can I use this information? Are my negative reactions to change short-term or longer lasting? Some of us dislike change and uncertainty but can, with time, adjust extremely well to the new situation. Sharing this process with your close colleague and even a trusted supervisor can help prevent some misunderstandings and ruffled feelings. As we navigate through our work days, we are confronted with conflict on different scales – perhaps someone drank the last cup of coffee and didn’t make more; maybe someone jammed the photocopier and walked away; or maybe you are experiencing bullying and harassment. The fact of the matter is that conflict has a ubiquitous influence on our working relationships. A 2008 study conducted by CPP Global found that employees spend an average of 2.8 to 3.3 hours a week dealing with conflict. Human resource workers spend upwards of 51% of their week addressing conflicts. Unmanaged conflict is costly. It affects the mental health of employees, which results in absenteeism, employee retention issues and a negative institutional reputation. Good employees and strong leaders are those who are not only aware of their conflict and communication styles, but are those who are able to direct those styles and skills towards win-win outcomes and positive working relationships. Let’s face it – the work can be fulfilling, but if the relationships are bad, the ship will sink quickly. Anchor yourself at work with the knowledge and skills you need to participate in meaningful conflict. If you know your default response to conflict, you will be better prepared to deal with conflicts when they arise. There are many benefits to knowing your style, including; the ability to move seamlessly between styles based on the situation; the ability to adapt your style based on the style of those you are in conflict with; and increased confidence with your ability to deal with conflict. All companies, organizations and workplaces have unique cultures of conflict. Do you work in an environment where conflict is embraced and seen as a force multiplier, or is conflict avoided at all costs? If you know the culture, you will be better equipped when conflict arises to be a positive contributor to the culture. Conflict can be fun! People often laugh at this statement, but it is true. Conflict is inevitable, and the best strategy is to develop a good understanding of your own responses to conflict. Learn to welcome conflict as a productive and enhancing workplace force. Not all workplaces can afford to send their staff to outside training, so employees may need to take matters into their own hands. Invest in your future by attending workshops and trainings that will enhance your interpersonal skills. Many not-for profit organizations offer inexpensive workshops on conflict management and communication skills. Author: By the TEND team with files from Meaghan Welfare.